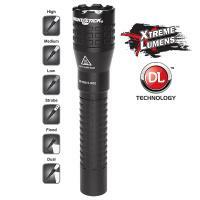 The NSR-9844XL Rechargeable Xtreme Lumens Multi-Function Tactical Dual-Light Flashlight uses a CREE LED rated at 650 lumens working in conjunction with a high-efficiency deep parabolic reflector to create a usable beam of light rated at 280 meters. A 200 lumen unfocused floodlight is integrated in to the housing which is perfect for close-up illumination. Both the flashlight and the floodlight can be turned on at the same time for maximum safety and versatility. The NSR-9844XL has a unique tail-switch that operates both the flashlight and floodlight in one configuration. The upper portion of the switch operates the flashlight that provides both momentary or constant-on functionality with high, medium or low-brightness settings as well as a disorienting strobe and the lower portion of the switch operates a downward facing floodlight. The housing, tail-cap and bezel are made from aircraft-grade 6061-T6 aluminum with a Type III hard-anodized finish. Power comes from a rechargeable Lithium-ion battery.